I picked up the latest Seth Godin paperback release at the airport bookstore last week and devoured it. After being inspired by The Dip and The Big Moo, I was excited to have the opportunity to grab five hours of flight time for a Seth pep talk. It was worth the 16 bucks. As an entrepreneur and someone who is constantly working to do remarkable work for my clients, Godin’s focus on artistry resonated and validated what I and many of my clients do every day: Engage in “artistry” (Godin’s term), rising above the pack to add that which cannot be described in a policy manual or procedure, adding that special something – creativity, emotional energy, caring – that sets my work above the rest. You probably do that too, and are at your best and most energized when you are in that zone. Godin profiles people including coffee shop employees, CEOs and sales executives, creating opportunities to identify commonality between the reader and Godin’s subjects. One of the reasons that I still prefer paper books over the Kindle for non-fiction with lasting value is that I like to scribble in the margins. Stars, checks, lines, comments and other visual reminders of, “Hey, this seemed important at 30,000 feet,” make up my system. This book is now filled with them. Are you working for someone else? 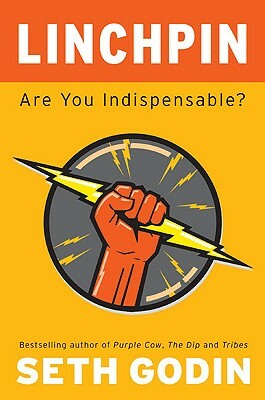 Become a linchpin. Be indispensable be doing more than is expected, by adding the qualities that are unique to you. Are you an entrepreneur? Work hard, work fast and give you best as a gift to your clients and employees. You too will become indispensable. Godin’s point is simple, but profound in its ramifications. If your job can be described in a training guide or a policy manual, if it can be automated or given to someone else willing to do it at a lower price, you are cooked. He challenges us to think and act, working to be remarkable, indispensable artists of our trades.